Saba Mahmood, Professor of Anthropology at the University of California at Berkeley, passed away on March 10th, 2018. The cause was pancreatic cancer. Professor Mahmood specialized in Sociocultural Anthropology and was a scholar of modern Egypt. Born in Quetta, Pakistan in 1962, she came to the United States in 1981 to study architecture and urban planning at the University of Washington in Seattle. She received her PhD in Anthropology from Stanford University in 1998 and taught at the University of Chicago before coming to the University of California at Berkeley in 2004, where she offered her last seminar in fall 2017. 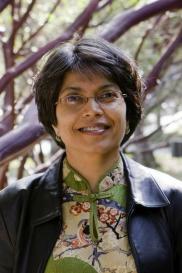 At Berkeley, in addition to the Anthropology Department, Professor Mahmood was affiliated with the Center for Middle Eastern Studies, the Program in Critical Theory and the Institute for South Asia Studies (where she was instrumental in creating the Berkeley Pakistan Studies Initiative, the first of its kind in the United States). Mahmood made path-breaking contributions to contemporary debates on secularism, opening up new ways of understanding religion in public life and contesting received assumptions about both religion and the secular. Against an increasingly shrill scholarship denouncing Muslim societies, she brought a nuanced and educated understanding of Islam into discussions of feminist theory, ethics and politics. Her publications and presentations have reverberated throughout the humanities and social sciences, profoundly shaping the scholarship of a new generation of scholars as they develop a thoughtful, knowledgeable, and critical approach to religion in modernity. As a scholar and teacher, she embodied and followed strong moral and political principles, offered keen analyses of colonial and capitalist power in her account of secularism’s modernity, and formulated new ways of understanding the subject of feminism, relational subjectivity, religious freedom, religious injury, the rights of religious minorities, and comparative legal analysis of religious and secular family law and sexual regulations. Together with anthropologists Talal Asad and Charles Hirschkind, Mahmood showed secularism to be a complex political formation that produces differences among the religious traditions it seeks to regulate. In her words, “political secularism is the modern state’s sovereign power to reorganize substantive features of religious life, stipulating what religion is or ought to be, assigning its proper content, and disseminating concomitant subjectivities, ethical frameworks, and quotidian practices.” Secularism never escapes its own religious histories, nor does it ever achieve autonomy from the religious formations it aims to regulate. In fact, the distinction between public and private life central to secular reason draws its bearings from a modern Christian emphasis on private worship. This Christian religious framework, focused on belief, contrasts sharply with religions such as Islam which foreground strongly the role on embodied practices within religious life. As a result, she argued, secular epistemologies cannot grasp the way that Islam articulates religious values, misconstruing both the Islamic subject and the public meanings of its religious practices. Within feminist theory, Mahmood challenged readers to understand that the pious Muslim women she studied in Cairo were not mindlessly obedient subjects, but engaged in distinct hermeneutical approaches to reading the Qur’an in schools of their own, cultivating religious practice as a form of ethical conduct. Challenging views of subjective freedom bequeathed by Western moral philosophy, she made a bold and challenging argument: to understand pious women within Islam one had to conceive of a subject defined in its relation to the textual and imagistic representations of the divine. Women who engaged in a religious practice of this sort, she argued, ought to be understood as engaging in ethical practices of self-cultivation. And yet, in these cases, the subject of ethics is not voluntaristic, a notion that would separate ‘free will’ from formative social and religious norms; rather, in Islam, the subject of ethics embodies a living and practiced relation to the divine, and requires a different notion of subject-formation. One consequence of this view was made clear in her intervention in the 2006 debates on the Danish cartoons caricaturing Mohammed. Those who claimed that such images were merely offensive missed the nature of the injury itself. Within Islam, she argued, the attack on the divine image is the same as the attack on the living and embodied self, since that self resides in that very relation. In her last work, she studied the discrimination against Coptic Orthodox Christians in contemporary Egypt’s secular regime. Against the view that tribal and religious differences are evidence of the incomplete process of secularization, she showed how religious differences, and conflict, have been exacerbated under secular regimes of power. She argued that the discrimination and violence suffered by Coptic Christians have increased as the modern state more fully regulated and managed religious life, imposing its own rationales onto debates about religious doctrine and practice. Far from realizing ideals of civic and political equality, the secular state facilitated religious inequalities and inter-faith violence. Mahmood considered the norms and practices developed within Islam for negotiating religious difference, showing how such religiously informed techniques of civic governance are overridden by secular regimes of power. Mahmood was the single author of Religious Difference in a Secular Age: A Minority Report (Princeton University Press, 2015) and Politics of Piety: the Islamic Revival and the Feminist Subject (Princeton University Press, 2005) which won the Victoria Schuck Award from the American Political Science Association. She co-authored Is Critique Secular? (Fordham University Press, 2011) and co-edited Politics of Religious Freedom (University of Chicago, 2015). Her work has been translated into Arabic, French, Persian, Portuguese, Spanish, Turkish, and Polish. She published numerous articles in the fields of anthropology, history, religious studies, political science, critical theory, feminist theory, and art criticism and served on several journal boards and read for many presses. Professor Mahmood was the recipient of several honors and awards, including the Axel Springer Fellowship at the American Academy in Berlin, and fellowships at the Center for Advanced Study in the Behavioral Sciences at Stanford University and the University of California Humanities Research Institute. She was the recipient of a major grant from the Henry Luce Foundation’s Initiative on Religion and International Affairs as well as the Harvard Academy of International and Area Studies. She also received the Frederick Burkhardt Fellowship from the American Council of Learned Societies, as well as the Andrew Carnegie Scholars’ program as a young scholar. She was awarded an honorary doctorate from the University of Uppsala in Sweden in 2013. Saba Mahmood was a brilliant scholar, cherished colleague, and dedicated teacher and graduate mentor. Along with her ceaseless political passions and trenchant analyses, she keened to the beauty of the wilderness, the poetry of Ghalib, the delights of cooking and sharing excellent food. She cultivated with joyous attention her relationships with family and friends. She mentored her students with remarkable care and intensity, demanding their best work, listening, responding with a sharp generosity, coming alive in thought, and soliciting others to do the same. In her final months, she affirmed the values of thought and love, leaving now a vibrant legacy that will persist and flourish among all whose lives were touched by her life and work. She is survived by her husband, Charles Hirschkind, her son, Nameer Hirschkind.